Your three-legged cat will thank you. Just check out any of your favorite social media feeds and you will notice that the use of proper grammar (and spelling) are usually as common as a Bigfoot sighting. I know, I know, you don’t care about grammar, you just want to get your message across as quickly as possible. The problem is that if your post is riddled with too many errors, people will soon give up and stop reading your amazing post about your fun-loving, three-legged cat. In fact, they might unfollow you all together. Oh, the horror! I’m not sure I’ve ever met someone who absolutely loves grammar, but as a business owner, I can tell you that there is nothing worse than receiving a resume from a prospective employee with numerous misspelled words. Usually, these resumes end up in the circular filing cabinet that I keep next to my desk. If your prospective employer doesn’t even look at your resume due to the number of errors, how do you think that you stand a chance landing that sweet job? Even as an English major, I still need some help every once in a while. My favorite helper is Grammarly. This free writing app makes my messages, documents, and posts clear, mistake-free, and effective. All you do is type up your version of War and Peace and Grammarly will watch over your shoulder to make sure that your masterpiece is free of careless mistakes. It’s like having an Honors English Major as your best friend. The good news is you won’t have to go to a super groovy poetry reading with them after you’ve finished writing. You can just close up your laptop and your nerdy (but extremely helpful) friend goes away and waits for you to return to display your literary prowess. 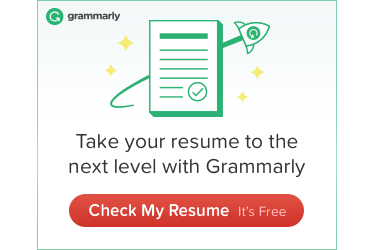 Grammarly offers a free version with no expiration date, but also offers Premium and Business versions if you are looking to really bump up your game. The cool thing about Grammarly is that it offers suggestions to your writing without autocorrecting. You get to choose whether you accept the suggestion or not. So go check it out! It’s free. What do you have to lose, except the next possible million followers of your three-legged cat? Download your copy today at grammarly.com and get ready to rid yourself of silly (and costly) mistakes. Did I mention your resume?